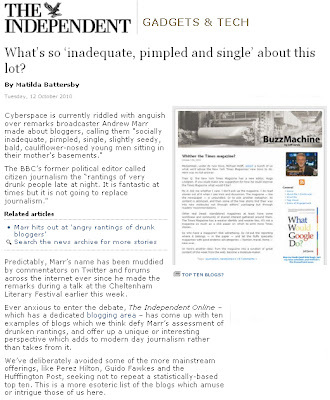 Bargainista Fashionista was namechecked last week in The Independent online, thanks to the BBC's Andrew Marr. 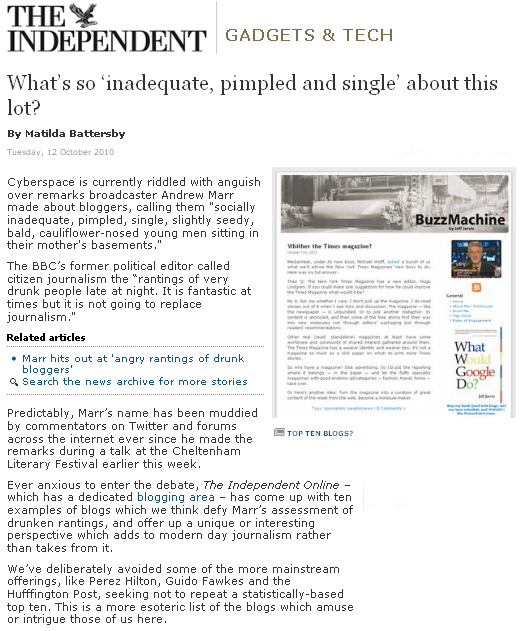 Speaking at this month's Cheltenham Literary Festival, Marr had branded bloggers as 'socially inadequate, pimpled, single, slightly seedy, bald, cauliflower-nosed young men sitting in their mother's basements and ranting'. Now, while I'm pretty sure I wasn't the object of Mr Marr's scorn (I certainly don't fit that description! ), I am pleased The Indy waded in and joined the debate, especially as Marr had said 'most citizen journalism strikes me as nothing to do with journalism at all' and that blogging 'is not going to replace journalism'. On the latter point, I don't think most bloggers are trying to replace traditional forms of media. I, for one, hope that what I offer is an extension of magazines and websites. Well done Handpicked Media! Thanks for your support and thanks, too, to The Indy for the mention. I'm chuffed! Oh excellent! At the time I thought the comment of Andrew Marr's was an entirely misjudged rant - he clearly didn't have much real knowledge of bloggers, outside those that satisfied his preconceived notions. And his clear bias against blogging didn't say much for professional journalism, in my opinion! I agree with Penny Dreadful; he clearly wasn't speaking from a position of actual knowledge...!